On August 15, 1483, Pope Sixtus IV consecrated the Sistine Chapel. The works of Michelangelo were years away—the artist was only eight years old at the time and had no idea what the building's future held for him (and vice versa). But even before he added his famous ceiling and frescoes, the Cappella Sistina served an important role within the Vatican (and it already had its fair share of fine art, too). 1. IT WAS BUILT FOR WORSHIP—AND DEFENSE. Construction on the chapel began in 1475 (coincidentally, the year of Michelangelo's birth). It was intended to replace an assembly hall for select members of the clergy and local elites. The building was completed around 1481 and was designed to have sturdy, high walls to help defend against any potential attacks on the Vatican. Architect Baccio Pontelli designed the chapel—he is also known for another Roman Renaissance marvel, the Ponte Sisto bridge that spans the Tiber river. 2. IT MIGHT BE A RECREATION OF AN ANCIENT TEMPLE. According to many scholars, the main hall’s dimensions were designed to match Solomon’s Temple in Jerusalem, which was destroyed by the Romans in 70 CE. According to the Bible (1 Kings 6), “The house that King Solomon built for the LORD was sixty cubits long, twenty cubits wide, and thirty cubits high.” (A cubit back then was defined as the distance from the elbow to the tip of the middle finger.) The dimensions of the main hall of the Sistine Chapel are approximately 132 feet long, 44 feet wide, and 68 feet high. But other scholars think that these proportions are too approximate for it to be a recreation, and instead think that these were just a common set of Renaissance building proportions. 3. IT'S STILL USED FOR ITS ORIGINAL PURPOSE. Named for Pope Sixtus IV, who consecrated the chapel and held its first mass on August 15, 1483, the Sistine Chapel was built to be the Pope’s personal chapel, and it serves that function to this day. It is also the site of the papal conclave, where the College of Cardinals meets to elect new popes. 4. MICHELANGELO ISN'T THE ONLY MASTER WHOSE WORK IS DISPLAYED. Before the Sistine Chapel formally opened, the Pope commissioned artists like Sandro Botticelli, Cosimo Rosselli, and Pietro Perugino to cover the interior walls with frescoes. (This took place around 1481.) The hires, who were from other city-states like Florence, made quite an impact: they brought Renaissance art to Rome and helped usher in an artistic awakening in the papal capital. 5. THE ORIGINAL CEILING WAS PRETTY PLAIN. The chapel’s most famous artwork would not be created until a few decades after its opening. The original ceiling did not feature Michelangelo’s sprawling vision, but rather a blue sky painted with gold stars. This was the work of artist Piermatteo d'Amelia, and it would not last long. 6. THE WORLD HAS A CRACK TO THANK FOR MICHELANGELO'S MASTERPIECE. In 1504, construction work near the chapel caused a crack to form in its ceiling. The damage was repaired, but the fix disrupted d'Amelia’s starry painting. The sitting pope at the time, Julius II (Sixtus IV's nephew), sought to commission a new artist to repaint the ceiling, and in 1508 he hired Michelangelo Buonarroti. Michelangelo was in the midst of sculpting Julius II’s tomb (a dramatically scaled down version of this project was finally finished in 1545) when he was called away to work on the Chapel. 7. MICHELANGELO DIDN'T THINK HE WAS A GOOD PAINTER WHEN HE WAS HIRED. Michelangelo considered himself to be a sculptor and nothing more. When the Pope commissioned him to work on the Sistine Chapel, the artist insisted he didn't have talent as a painter. According to art critic Andrew Graham-Dixon, author of Michelangelo and the Sistine Chapel, Michelangelo dreaded the project to the point of paranoia—he thought he was being set up by his enemies for failure and humiliation. He wanted nothing more than to stick to sculpting, but he was put in an awkward situation because he couldn’t turn down the Pope’s request. Despite harboring extreme doubts about his own abilities, Michelangelo decided to exceed the plans he had been hired to take on. Originally, he was supposed to paint the 12 Apostles, each in a vaulted nook, but he convinced the Pope to let him contribute something much grander. He wound up painting the entire ceiling, which takes up around 12,000 square feet of space, and other segments of the Chapel’s walls. 8. MICHELANGELO WAS A NERVOUS WRECK. 9. HE DIDN'T PAINT LYING DOWN. Michelangelo and his team designed a scaffold that allowed him to paint the ceiling while standing up, not lying on his back. According to King, this myth has its origins in a mistranslation from a 1527 biography of Michelangelo written by Paolo Giovio, the bishop of Nocera. He uses the word resupinus, meaning “bent backward,” though some interpreted it as “on his back.” The resulting misunderstanding led to many (incorrect) depictions of a supine Michelangelo hard at work, like Charlton Heston’s Michelangelo in The Agony and the Ecstasy (1965) or the animatronic Michelangelo in Epcot's Spaceship Earth ride. 10. THE PROJECT LEFT MICHELANGELO IN AGONY. (or anywhere else where the stagnant water's poison). 11. THE PAINT WAS OVERTAKEN BY MOLD. In the midst of painting the fresco, around January of 1509, Michelangelo’s work “began to turn moldy, so that the figures could hardly be discerned,” according to biographer Ascanio Condivi, writing in 1553. The lime became too damp, perhaps because Michelangelo and his crew had applied plaster while it was still wet. This caused a kind of fungal growth, and much of the completed work was ruined. Legend has it that Michelangelo went to the Pope and said, “I told Your Holiness that I was no painter. What I have done is ruined: if you do not believe it, send someone to see.” But the Pope told him to carry on, so Michelangelo had to scrape away all the affected work and start again from the beginning. 12. MICHELANGELO MADE IT UP AS HE WENT ALONG. 13. NOT EVERYONE KNEW GOD WAS SUPPOSED TO BE GOD. In earlier imagery, God was shown as staid, solemn, and stationary (if at all). This represented a stark break from tradition. 14. YOU AREN'T ALLOWED TO TAKE PHOTOS INSIDE THE CHAPEL. More than 4 million people visit the Sistine Chapel each year. Despite the deluge of tourists, one decidedly anti-tourist rule is in effect: No photography is allowed in the main hall. As Rick Marshall explained for mental_floss, when Vatican officials wanted to restore Michelangelo’s works in the Chapel in 1980, “the price tag for such an endeavor prompted them to seek outside assistance to fund the project.” Nippon Television Network pledged the most money ($3 million) and was awarded with exclusive rights to photography and video for all the art. Though the exclusive contract has since expired, the Vatican keeps the no photography rule alive to this day. 15. MEXICO HAS A REMARKABLY ACCURATE RECREATION OF THE SISTINE CHAPEL. If you do want to snap a few Instagrams of Michelangelo’s work, may we suggest Mexico? 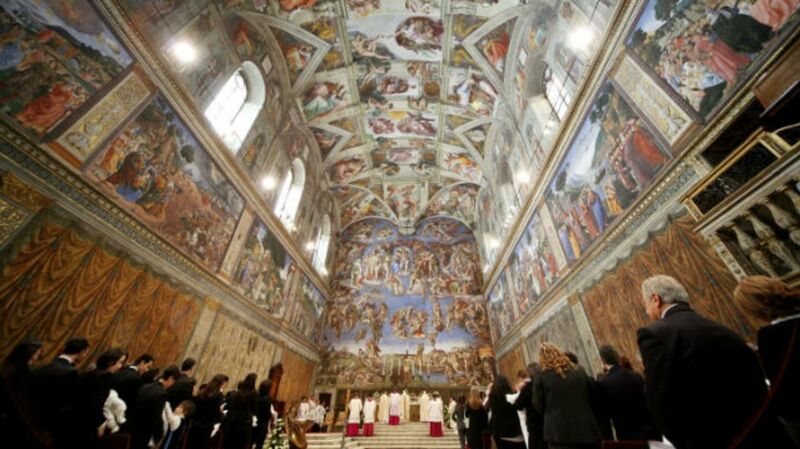 A Vatican-approved, full-size replica of the Sistine Chapel’s main hall was unveiled in Mexico earlier this year. (It started in Mexico City and will be touring the country over the next three years.) The Capilla Sixtina en México cost around $2.4 million to build, and the interior artworks were painstakingly recreated by copying over 2.6 million photographs. The process of taking those photos was staggering in its own right; it took 170 nights under strict supervision from the Vatican's museum director to snap all the needed images.